I'm happy that Misty was found unharmed. Hope you guys have a great day. So glad Misty didn't come to any harm; what a wonderful way for Pierce to learn about how to care for another living being responsibly! Very cool! Bet pierce is excited! !! I am so glad you found her. It sounds like quite a search! What a riot! Glad you were able to find her though! Maybe it went in search of a larger shell, maybe he will want to put some in with misty just in case. Good you found her...I know how it is when you lose something and frantically look for it! This search had all on their toes! Hope you have a great day! My first thought was ... oh Lord, hope they didn't step on it! I don't know why, but this is completely cracking me up! I need you to write a children's book about Misty! Wow- that's a hardy crab- glad y'all found it- she could have ended up anywhere! Crabs like warm places.. If one of the kids were napping I'm sure the crab would of found a warm spot next to where they were sleeping. So happy he was found safe~! Better get a bigger home he is going to get bigger and require a bigger house to carry around..they sell them at pet stores..
Awwww, how sweet that he takes such good care of her. I am shocked you were able to find her though after "Misty's Big Adventure". Glad Misty was unharmed, and poor little Pierce! I hope he wasn't too upset by the incident. I'll never forget the day a neighbor dropped off her rat terrier, and left. We put the dog outside, where he promptly squeezed through our back gate and took off running down the street. Luckily her just ran back home, where we found him sitting on his front porch waiting for his master to return. We recaptured him, took him back to our place and made the gate escape proof, but it sure just about gave me heart failure when I thought I'd lost that dog! so glad she was found unharmed. i really love your narrative skill! I am so glad you found him unharmed. Pets are so important for children. They help them learn responsibility. Hope you are having a great day. A hermit crab on the loose is not a good thing. I bet he was so worried that it will never happen again. Loosing a special friend is no fun. So glad she wasn't crushed or hurt. 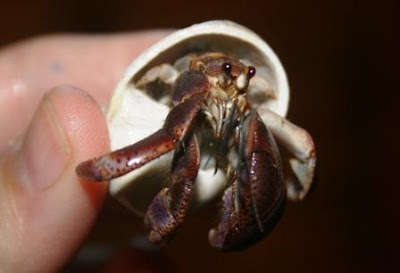 She is a lucky hermit crab with you having two cats! Glad she was ok.
Oh goodness, I'm glad Misty made it through the adventure! Sounds like she had a wild night! Misty had quite the adventure! Poor Pierce. I'll bet he was really worried. yikes....that could have ended badly!! So glad you found her. We had a turtle do that when I was a young child. So glad you found her!!!!!!!!! Ugh. That is a scary lesson. My kids always had hamsters. And I don't care what kind of cage you have, those suckers have a way of getting out. One particular hamster got out and chewed up everything TeleTubbies (which was in at the time) in my kid's closet. Boy, was THAT a lesson! Put the dang hamster cage in the bathroom EVERY night for safe keeping, for goodness sake! Yikes, I'm glad she was okay. I would hate to have heard what happened had the cats gotten a hold of her. The tale of the missing crab. It could totally be a story in a book. I'm glad you found her!!! A Great pet for a youngster!! 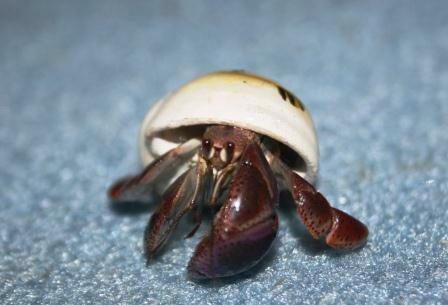 I have fond memories of my own hermit crab pets -- they can be quite the escape artists, too, be warned! Glad you found her!